flies you through Madagascar, where they are helping local communities forge new economic paths through REDD (Reducing Emissions from Deforestation and Forest Degradation) projects. Stone Gossard, of Pearl Jam, also speaks about their support of Conservation International's efforts through donations from concert ticket revenue. 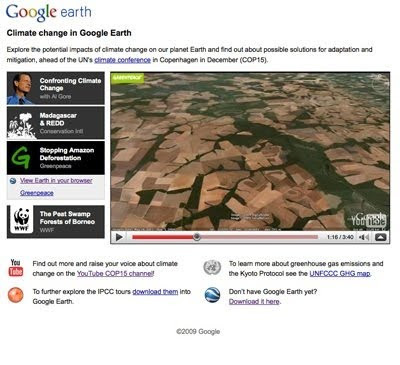 Take a virtual tour with WWF of the peatland swamps in Sebangau, Borneo. With the deforestation and burning of peatland for agriculture, vast amounts of carbon emissions are released. WWF has helped local communities preserve their peatland swamps, which you can fly over in this tour. See all these tours now by visiting www.google.com/cop15, and clicking on the button for each tour. Then stay tuned for more! Following last week's launch of the new Climate Change in Google Earth tour series, we are excited to announce the release of three more tours. These tours shed light on solutions that non-profit organizations and communities are doing to prevent or adapt to further climate change. The new tours we released today all involve deforestation -- preventing, protecting, and preserving our global forests around the world in an effort to reduce emissions of carbon dioxide, a large part of the cause of climate change. Greenpeace tells a story of a successful collaboration between companies, such as McDonald's, and Greenpeace campaigners to establish a moratorium on further destruction of Amazon rainforest for soybean plantations. Conservation International flies you through Madagascar, where they are helping local communities forge new economic paths through REDD (Reducing Emissions from Deforestation and Forest Degradation) projects. Stone Gossard, of Pearl Jam, also speaks about their support of Conservation International's efforts through donations from concert ticket revenue.